Emperor Huizong (宋徽宗, 1082–1135), was the eighth and one of the most famous emperors of the Song Dynasty, with a personal life spent amidst luxury, sophistication and art but ending in tragedy. Born Zhao Ji (趙佶), he was the 11th son of Emperor Shenzong. In February 1100 his older half-brother Emperor Zhezong (哲宗) died without a surviving son, and Huizong succeeded him the next day as emperor. He reigned from 1100 to 1126. Huizong was famed for his promotion of Taoism. He was also a skilled poet, painter, calligrapher, and musician. 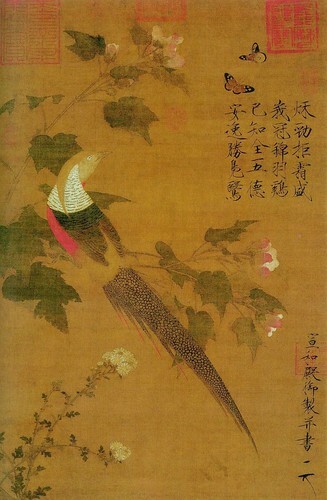 He invented the "Slender Gold" style (瘦金體) of calligraphy. The name "Slender Gold" came from the fact that Huizong's writing resembled gold filament, twisted and turned. 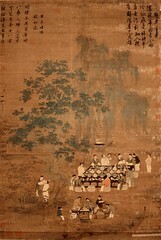 Huizong sponsored numerous artists at his court, and the catalogue of his imperial painting collection lists over 6,000 known paintings. 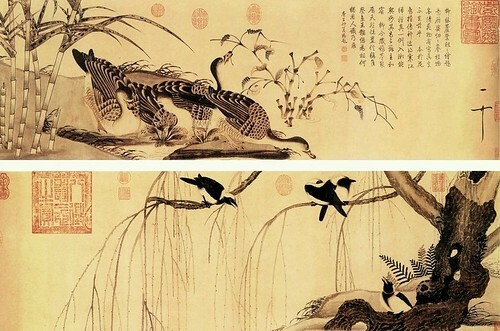 Huizong took huge efforts to search for art masters. He established the "Han Lin Hua Yuan” (the imperial painting house, 翰林畫院), where the best painters all over China share their best works. 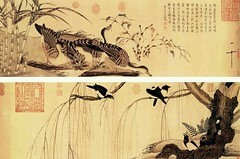 His era name of Xuanhe is also used to describe a style of mounting paintings in scroll format. 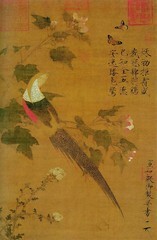 In this style, black borders are added between some of the silk planes. He was also a player of the guqin (a traditional string instrument, 古琴), as exemplified by his famous painting “Listening to the Qin (聽琴圖)”. He also ordered the construction of a “Wanqin Tang” (The Hall for Ten-Thousand Qin, 萬琴堂) in his palace. In 1114, following a request from Emperor Yejong of the Korean court of Goryeo, Huizong sent to the palace in the Goryeo capital at Gaeseong a set of musical instruments to be used for royal banquet music. Two years later, in 1116, he sent another, even larger gift of musical instruments (numbering 428 in total) to the Korean court, this time yayue (elegant music, 雅樂) instruments, beginning that nation's tradition of aak. 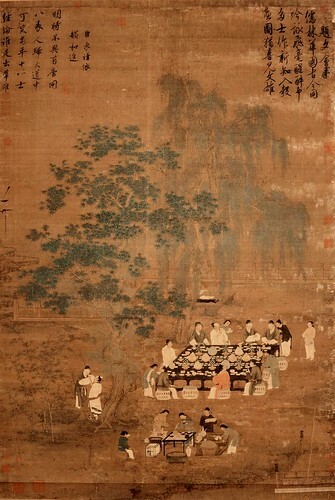 Huizong was also a great tea enthusiast. He himself wrote the famous Treatise on Tea, the most detailed and masterful description of the Song Dynasty sophisticated style of tea ceremony. 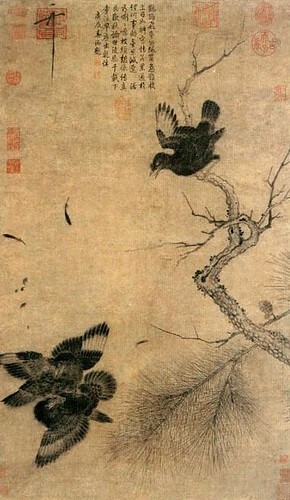 A true artist, Huizong neglected the army, and Song China became increasingly weak and at the mercy of foreign enemies. When the Jurchen of Manchuria founded the Jin Dynasty and attacked the Liao kingdom to the north of the Song Empire, the Song court allied with the Jin and attacked the Liao from the south. This succeeded in destroying the Liao kingdom, a long time enemy of the Song. However, an enemy even more formidable, the Jin, was now on the northern border. Not content with the annexation of the Liao kingdom, and measuring rightly the weakness of the Song empire, the Jin soon declared war on their former ally, and by the beginning of 1126 the troops of the Jin "left vice-marshal" Wanyan Wolibu crossed the Yellow River and came in sight of Kaifeng, the capital of the Song empire. Stricken with panic, Huizong abdicated on January 18, 1126 in favor of his son who became Emperor Qinzong (欽宗). Huizong, his son Emperor Qinzong, as well as the entire imperial court and harem were eventually captured by the Jin in the Jingkang Incident, and shipped north, mostly to the Jin capital of Shangjing (near today's Harbin). One of the sons of Huizong managed to escape to Southern China where, after many years of struggle, he would establish the Southern Song Dynasty, of which he was the first emperor, Emperor Gaozong (高宗). Huizong died as a captive a few years later.